Frank, First prize Galloway steer Smithfield 1994. Langholm show in 1994, shown by Melanie Waugh. Smithfield in 1996, shown by David Sinclair. 1997at Carlisle, sold for 780gns. Galloway Bull at Carlisle Spring sale 2007. Galloway at at The Scottish Winter Fair 2007. Superman at East of England stock Festival Taking the steer championship title was Superman, a Galloway forward by Michael and Melanie Alford, Cullumpton, Devon. This one which weighed in at 738kg was bought last September from A Waugh, Cumbria. 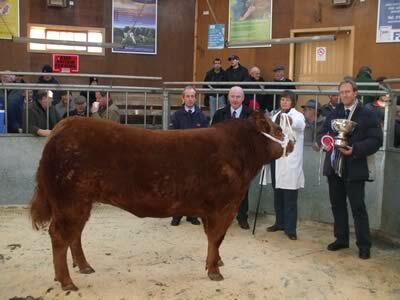 And a good investment he was having already takeb the native steer title at Agri Expo, Carlisle last month. Superman will be shown at Scottish Winter Fair in the coming weeks. sold to 6,000gns at the spring show and sale of Galloway cattle at Castle Douglas last week. Sale leader was the 11-month-old Ruler of Kilnstown from Kilnstown Farms, Bewcastle, Carlisle. By the new AI sire Orinocho of Over Barskeoch, this bull sold to W. McMorran and Sons, Twynholm, Kirkcudbright. Kilnstown. Shown by Christine Williams. 1989, his Dam was Doreen 3rd of Kilnstown. Longtown xmas fatstock show 1998. Scottish Winter Fair 2002. Shown by Marion Paul. calf sale 2002. Sold for top price of £1600. photographed with her, she sold for £1400. Fair when shown by Mark Hallam. Fair 2007, shown by Christine Clark. Mule Ewe Lambs sold Annually at Carlisle.